If DTC P0196 is displayed with DTC P0197 or P0198, first perform the trouble diagnosis for DTC P0197 or P0198. Refer to EC-264, "DTC Logic". P0196 EOT SENSOR (Engine oil temperature sensor range/performance) A) Rationally incorrect voltage from the sensor is sent to ECM, compared with the voltage signals from EOT sensor and intake air temperature sensor. B) The comparison result of signals transmitted to ECM from each temperature sensor (IAT sensor, ECT sensor, FTT sensor, and EOT sensor) shows that the signal voltage of the EOT sensor is higher/ lower than that of other temperature sensors when the engine is started with its cold state. Is it necessary to erase permanent DTC? YES >> GO TO 6. Start engine and let it idle for 5 minutes and 10 seconds. Is 1st trip DTC detected? YES >> Proceed to EC-263, "Diagnosis Procedure". Check that вЂњCOOLANT TEMP/SвЂќ indicates above 80В°C (176В°F). If it is above 80В°C (176В°F), go to the following steps. If it is below 80В°C (176В°F), warm engine up until вЂњCOOLANT TEMP/SвЂќ indicates more than 80В°C (176В°F). Then perform the following steps. Turn ignition switch OFF and soak the vehicle in a cool place. Do not turn ignition switch OFF until step 8. If they are within the specified range, perform the following steps. If they are out of the specified range, soak the vehicle to meet the above conditions. Then perform the following steps. Do not turn ignition switch OFF. If it is supposed to need a long period of time, do not deplete the battery. Start engine and let it idle for 5 minutes. Perform component function check. Refer to EC-263, "Component Function Check". Use the component function check to check the overall function of the EOT sensor circuit. During this check, a 1st trip DTC might not be confirmed. NO >> Proceed to EC-263, "Diagnosis Procedure". Disconnect EOT sensor harness connector. Remove EOT sensor. Refer to EM-94, "Exploded View". 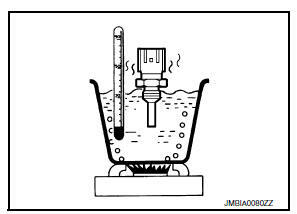 Check resistance between EOT sensor terminals by heating with hot water as shown in the figure. Check EOT sensor. Refer to EC-263, "Component Inspection". NO >> Replace EOT sensor. Refer to EM-94, "Exploded View". Disconnect engine oil temperature sensor harness connector. Remove engine oil temperature sensor. 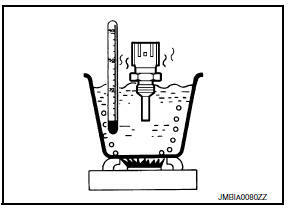 Check resistance between engine oil temperature sensor terminals by heating with hot water as shown in the figure. NO >> Replace engine oil temperature sensor. Refer to EM-94, "Exploded View".